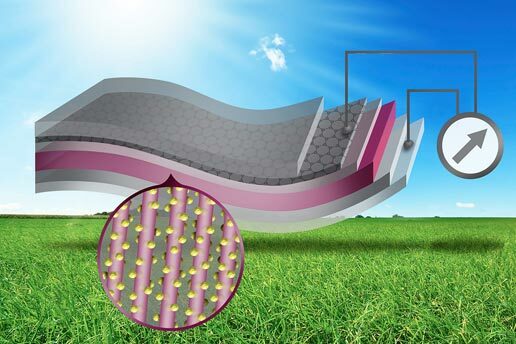 MIT researchers have produced a new kind of photovoltaic cell based on sheets of flexible graphene coated with a layer of nanowires. The approach could lead to low-cost, transparent and flexible solar cells that could be deployed on windows, roofs or other surfaces. The new approach is detailed in a report published in the journal Nano Letters, co-authored by MIT postdocs Hyesung Park and Sehoon Chang, associate professor of materials science and engineering Silvija Gradečak, and eight other MIT researchers. While most of today’s solar cells are made of silicon, these remain expensive because the silicon is generally highly purified and then made into crystals that are sliced thin. Many researchers are exploring alternatives, such as nanostructured or hybrid solar cells; indium tin oxide (ITO) is used as a transparent electrode in these new solar cells. “Currently, ITO is the material of choice for transparent electrodes,” Gradečak says, such as in the touch screens now used on smartphones. But the indium used in that compound is expensive, while graphene is made from ubiquitous carbon. The new material, Gradečak says, may be an alternative to ITO. In addition to its lower cost, it provides other advantages, including flexibility, low weight, mechanical strength and chemical robustness. Building semiconducting nanostructures directly on a pristine graphene surface without impairing its electrical and structural properties has been challenging due to graphene’s stable and inert structure, Gradečak explains. So her team used a series of polymer coatings to modify its properties, allowing them to bond a layer of zinc oxide nanowires to it, and then an overlay of a material that responds to light waves — either lead-sulfide quantum dots or a type of polymer called P3HT. Despite these modifications, Gradečak says, graphene’s innate properties remain intact, providing significant advantages in the resulting hybrid material. In addition, unlike the high-temperature growth of other semiconductors, a solution-based process to deposit zinc oxide nanowires on graphene electrodes can be done entirely at temperatures below 175 degrees Celsius, says Chang, a postdoc in MIT’s Department of Materials Science and Engineering (DMSE) and a lead author of the paper. Silicon solar cells are typically processed at significantly higher temperatures. The manufacturing process is highly scalable, adds Park, the other lead author and a postdoc in DMSE and in MIT’s Department of Electrical Engineering and Computer Science. The graphene is synthesized through a process called chemical vapor deposition and then coated with the polymer layers. “The size is not a limiting factor, and graphene can be transferred onto various target substrates such as glass or plastic,” Park says. Gradečak cautions that while the scalability for solar cells hasn’t been demonstrated yet — she and her colleagues have only made proof-of-concept devices a half-inch in size — she doesn’t foresee any obstacles to making larger sizes. “I believe within a couple of years we could see [commercial] devices” based on this technology, she says. László Forró, a professor at the Ecole Polytechnique Fédérale de Lausanne, in Switzerland, who was not associated with this research, says that the idea of using graphene as a transparent electrode was “in the air already,” but had not actually been realized. The work also involved MIT professors Moungi Bawendi, Mildred Dresselhaus, Vladimir Bulovic and Jing Kong; graduate students Joel Jean and Jayce Cheng; postdoc Paulo Araujo; and affiliate Mingsheng Wang. It was supported by the Eni-MIT Alliance Solar Frontiers Program, and used facilities provided by the MIT Center for Materials Science Engineering, which is supported by the National Science Foundation.